I'm feeling so happy today! The weather has been so nice and we've had a nice day out. My boyfriend had a day off work so we went to a Roman fort site nearby. Don't get me wrong, I'm really not a history nerd, I just love the field and the view is amazing. I used to spend a lot of time there as a child so to take my own child there as an adult was really strange! We had a lovely day in the sun so I've really enjoyed myself! Another good thing that has happened is that I managed to retrieve my photos! If you've read my blog over the past two days you'll know that my photos for the last few weeks all vanished from my SD card... I downloaded a free program called TestDisk that let me do an unlimited scan and retrieve. The program isn't for people who want anything fancy, it has no graphical user interface, so it's just white words on a black background (in Terminal for Mac users such as myself) but it worked perfectly, and so I have everything back! Anyway, enough of that an onto the polish. 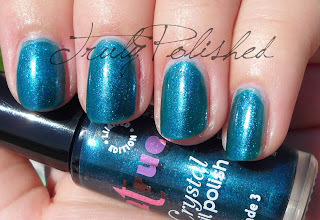 Today I have one of the 2true polishes I showed you last night in my haul post. 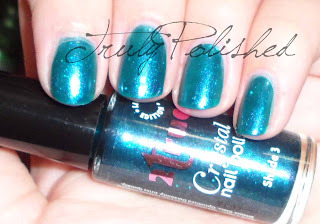 This is from a set of three (I assume it's three, that's all I could find) limited edition shades from the 2true Crystal Nail Polish collection. Shade 3 (very imaginative, I know) is a teal glitter polish. This was really easy to apply and went on easily in two coats. When I wear this again I'll probably use three coats. The photos below show two coats with topcoat. 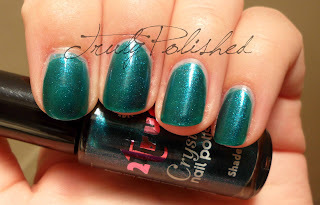 I used Seche Vite and even that seemed to soak in! I think in future two coats of Seche Vite would be better. I really like this polish but I don't love it. In the shop I thought it had a slight duochrome to the shimmer but it didn't show up in real life! You can buy this at Superdrug for £1.99 (7ml bottle). They also do a 3 for 2 on this brand too, I picked up all three LE shades for £2.98! I'll have the other two shades from this collection coming up over the next week or so!